Once upon a time, a theatre at the back of Fantasyland put on magical shows with Mickey, Minnie and other Disney friends. 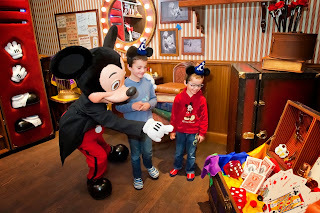 However, this eventually became unused, but Disneyland Paris had a unique solution, a meet and greet location with the most popular character. By using a large area of space, guests could be entertained and be immersed in a story during a Meet and Greet opportunity, a concept unique in Disneyland Paris. The story goes that Mickey is preparing for his next show on stage, but has made some time to meet his very special friends in his dressing room. Guests get a private one on one and photo opportunity with the most in demand character. As guests approach the building guests see posters of the Disney gang wearing some familiar, yet unusual outfits giving an almost theatre poster aesthetic to the exterior of the building, as we enter we walk towards the main queueing area to find a stage with a screen showing a 45 minute loop of classic Mickey Mouse shorts in both French and English. As guests move closer and closer to the meeting location, they turn towards a backstage passageway where the walls are adorned with gorgeous posters for the classic shorts guests have just watched. 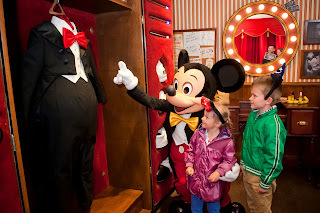 As they enter the dressing room, many Disney references are cleverly hidden for Disney fans to spot. The main experience is short and sweet, yet incredibly enjoyable. Guests have very cleverly been ‘tricked’ into thinking this is a one on one experience. Meeting Disney’s most popular character suddenly got so much easier, and yet much more personal. Gone are the scrums of people huddling around Mickey, and enters a relaxed experience allowing for special family memories to be created. 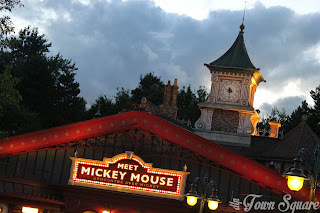 Meet Mickey Mouse is just one addition during this 20th Anniversary celebration period which we feel has drastically changed an experience in the park for the better. Whilst the queue may be long at times, guests are entertained throughout thanks to the short cartoons, Disney fans will find contentment in the spotting of references to Disney history. On top of that, the experience feels private and as such, Mickey spends a good amount of time with all his friends making many guests days unforgettable. This attraction has made great use of available space, and should be discovered by all Disneyland Paris fans.